‘Aroeira-do-sertão’ (Myracrodruon urundeuva Allemão; Anacardiaceae) is one of the most-used medicinal species by the population of northeastern Brazil and is on the list of plants threatened with extinction. In this context, alternatives that could contribute to reduced extractive use must be designed to establish crops of this species, which have high concentrations of metabolites. Inoculation with arbuscular mycorrhizal fungi (AMF) and the addition of phosphorus (P) to soil increases the production of primary and secondary metabolites in some plants. We tested the hypothesis that the effects of mycorrhization in ‘aroeira’ can be maximized by the application of P. The dry matter and the concentration of metabolites were evaluated. Mycorrhization increased the accumulation of phytomass, which was also favored at the highest dosage of P tested. 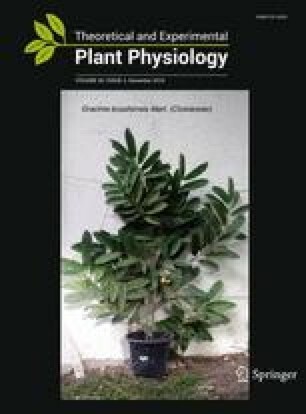 The production of phenols and total proteins was maximized by mycorrhization only at an intermediate dosage of P. The inoculation did not favor the synthesis of flavonoids and soluble carbohydrates. The production of proanthocyanidins was influenced only by phosphate supplementation. It is concluded that the mycorrhization of seedlings of ‘aroeira-do-sertão’ associated with P fertilization maximizes the production of total phenols and total foliar proteins, making the phytomass more attractive to the herbal industry and resulting in the use of P fertilization. The authors acknowledge the Conselho Nacional de Desenvolvimento Científico e Tecnológico (CNPq) for financial support (Edital Universal, Proc. No. 473779/2011-0) and for productivity research grants (Proc. Nos. 307749/2015-0 and 307129/2015-2).